What Can Prevent You From Joining the Air Force? The Air Force Pilot profession is a highly competitive field. Not only is it difficult to qualify for physically, but academically as well. Some of the best students in the Air Force Academy, ROTC Units, and OCS programs make it into the pilot programs, however, not everyone can join the Air Force. In fact, there are several physical medical conditions that can disqualify you from flying training (all classes), or continued flying duty (classes II or III) unless a waiver is granted. Acute medical problems, injuries, and some therapies are cause for withholding certification for flying training or temporarily restricting an individual from flying until the problem is resolved. These standards are not all inclusive and other diseases or defects can be cause for rejection based upon the judgment of the examining flight surgeon. 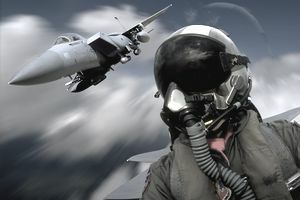 Any condition that in the opinion of the flight surgeon presents a hazard to flying safety, the individual's health, or mission completion is cause for temporary disqualification for flying duties. Not pose a risk of sudden incapacitation. Pose minimal potential for subtle performance decrement, particularly with regard to the higher senses. Be resolved or be stable and be expected to remain so under the stresses of the aviation environment. If the possibility of progression or recurrence exists, the first symptoms or signs must be easily detectable and not pose a risk to the individual or the safety of others. Cannot require exotic tests, regular invasive procedures, or frequent absences to monitor for stability or progression. Must be compatible with the performance of sustained flying operations in austere environments. These conditions can range from being outside the height / weight standards of the Air Force, genetic conditions in the heart, lungs, sinuses, or poor vision. However, applicants who have had PRK and LASIK eye surgery are no longer automatically disqualified from flight training. You can not enter into the training pipeline and stay a pilot with these two laser eye treatments. Flying Class I qualifies for selection into Enhanced Flight Screening and commencement of undergraduate pilot training (UPT). Flying Class IA qualifies for selection and commencement of undergraduate naval gator training. Flying Class II qualifies undergraduate flight training students, rated officers, and physician applicants for Aerospace Medicine Primary training. Flying Class III qualifies individuals for non-rated duties in ASC 9D, 9E and 9W. Physiologic training standards (Attachment 8) qualifies individuals for non-rated duties in ASC 9G. Categorical Flying Class II qualifies rated officers for duty in certain restricted air craft categories. Flying Class IIA qualifies rated officers for duty in low-G aircraft (tanker, transport, bomber, T-43 and T-1). Flying Class IIB qualifies rated officers for duty in non-ejection seat aircraft. Flying Class IIC qualifies rated officers for aviation duty as specified in the remarks section of AF Form 1042, and as annotated on the AMS, SF 88, Report of Medical Examination, or AF Form 1446, Medical Examination - Flying Personnel. These waivers are coordinated with HQ USAF/XOOA. Personnel, including personnel of the ARC, are ordered to participate in frequent and regular aerial flight (Periodic Flying, Long). Flying personnel, including personnel of the ARC, are suspended from flying status for 12 months or more for medical reasons, applying for return to flying duties (Periodic Flying, long for ARC and PHA with AMS for AD/AF). Flying personnel are ordered to appear before a Flying Evaluation Board (FEB). (See AFI 11-401, Flight Management). (Periodic flying (long) for ARC and PHA with AMS for AD/AF). All members on flying status, annually, within 3 months preceding the last day of the birth month or 6 months for special circumstances, such as permanent change of station (PCS), temporary duty (TDY), retirement or waiver renewal, etc. Return to flying status after a break in flying duties. Vision requirements alone tend to hamper many pilot candidates, but other medical issues can stop a candidate in his/her tracks. Sometimes these conditions are genetic and the reason behind not being able to join is written typically by people not surviving the rigors of the training due to these medical issues. Not passing flight school tactics is the final challenge for people who academically, physically, and medically qualify. The learning curve is steep. Being a good student with above average hand-eye coordination is also required to be successful. What Are the Different Ranks in the Air Force? What Are the Physical Ability and Stamina Test Requirements for PJs?